It isn’t all about strength of schedule. When it comes to determining the top four teams each week, the 13 members of the College Football Playoff selection committee are also watching the game film — which is why No. 10 Ohio State is the lowest-ranked one-loss Power 5 team and looking up at a two-loss No. 7 LSU team. The committee saw Ohio State get thumped by Purdue 49-20 and almost lose to Nebraska. Ohio State’s game on Saturday at Michigan State could be the most dangerous for any CFP hopeful as far as playoff implications go because even though ESPN’s Football Power Index gives the Buckeyes a 60.2 percent chance to win, it’s the lowest percentage of any contender playing this weekend. If Ohio State loses, it’s done, which is why this is the top Week 11 game on ESPN Analytics’ Leverage Index. Of the 10 games left in the season that will have the biggest impacts on the playoff race, half of them will be played on Saturday. Looking ahead, the five most important remaining games are: 1. The SEC championship (Dec. 1), 2. Michigan at Ohio State (Nov. 24), 3. Oklahoma at West Virginia (Nov. 23), 4. Notre Dame vs. Syracuse (Nov. 17, Yankee Stadium) and 5. Notre Dame at USC (Nov. 24). The SEC championship game is listed because it’s the only conference title game that has already determined division winners. The ACC could be next, as Clemson can clinch the Atlantic Division on Saturday with a win at Boston College. One of Notre Dame’s goals this season was to win every home game, and the Irish can accomplish that on Saturday if they beat Florida State. Notre Dame has only three games left — and every one is among the top 10 leverage games. While also considering their chance to win, here’s a look at who has the most to lose in the playoff race, according to ESPN’s Leverage Index. What’s at stake: Everything. Ohio State trails Michigan by one game in the Big Ten East standings but will win the division if it wins out. 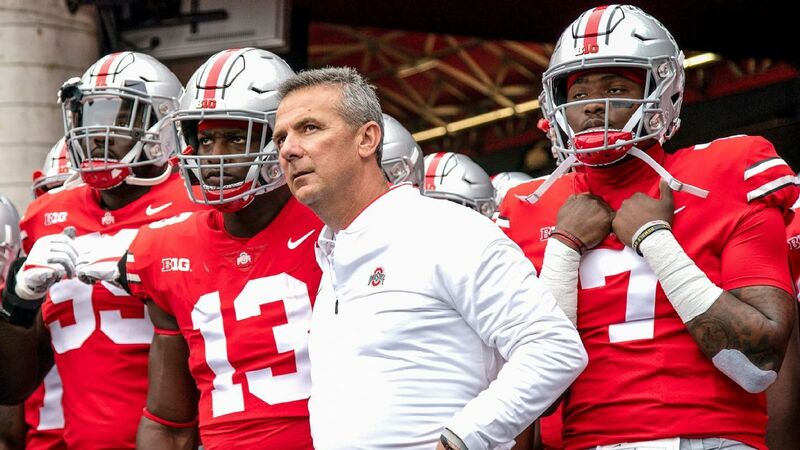 The Buckeyes will have home-field advantage against the rival Wolverines in the regular-season finale, but the significance of that game — beyond bragging rights — will diminish if Ohio State loses to MSU. A second loss would likely eliminate the Buckeyes from the playoff and would make it extremely difficult for them to win their division, as Michigan would have to lose at least once before visiting Columbus. That’s highly unlikely, considering Michigan’s next two games are at Rutgers (1-8) and home against Indiana (4-5). FPI says: Ohio State has a 60 percent chance to beat Michigan State. If the Buckeyes lose, their chance to reach the playoff drops to 1.4 percent. What’s at stake: The minute Notre Dame stumbles, it goes from playoff lock to on the bubble, and the Irish will be without starting quarterback Ian Book (rib injury). If the Irish lose, they can’t be counted out definitively, but it would be a big blow to their playoff résumé. It would all depend on what happens in the other Power 5 conference championship games. The committee could take a one-loss Notre Dame over a one-loss Washington State, for example, especially if Notre Dame beats USC on the road — something Wazzu couldn’t do. Notre Dame could also be chosen over a two-loss Big 12 champ, if that happens. A Notre Dame loss, though, might open the door for a second SEC team or help Clemson if the Tigers lose on Saturday. The problem for Notre Dame is that a loss to FSU would be a bad home loss to a 4-5 team ranked No. 110 in offensive efficiency, and that could be enough to keep the Irish out. FPI says: Notre Dame has a 91 percent chance to beat the Noles. If the Fighting Irish finish 12-0, they’re a lock to reach the playoff (98 percent according to Playoff Predictor). If they lose this game, it drops to 35.3 percent. What’s at stake: A potentially great debate. Georgia has already clinched the SEC East and is guaranteed a shot at No. 1 Alabama in the SEC title game, but would the committee take a two-loss SEC champion if Georgia stumbles this week, then upends the best team in the country? It’s hard to imagine the committee leaving out the SEC champion — period — but if the Bulldogs can’t beat Auburn, they probably aren’t going to knock off Alabama. Georgia has a 41 percent chance to reach the playoff, the second-best (behind Michigan) among teams with a loss. FPI says: Georgia has an 86 percent chance to beat Auburn. The Bulldogs have a 25 percent chance to win out. If they do, Playoff Predictor says there’s a 97 percent chance they’ll return to the semifinals. If Georgia loses to Auburn, its playoff chances drop to 15.5 percent. What’s at stake: The Atlantic Division title and potentially Clemson’s place in the playoff. The reason this game is lower on the leverage list is mainly because Clemson is so good (No. 1 in defensive efficiency, No. 7 in offensive efficiency). It might have a little more wiggle room than Notre Dame with a loss. (Clemson losing on the road to a ranked BC team would certainly look better than the Irish losing at home to embattled FSU.) If Clemson loses at BC, it would need the Eagles to lose again in the regular season to overtake them for the division title, and that’s not unfathomable, considering the Eagles still have to travel to Tallahassee and end at home against a surging Syracuse team. If BC wins out and wins the division, Clemson is in the same position Alabama was a year ago: a one-loss team that didn’t win its division but was ranked in the committee’s top four. Clemson would then have to hope that its 12-game résumé is better than that of the Power 5 conference champions and Notre Dame. FPI says: This is Clemson’s most difficult remaining game, and the Tigers still have an 88.5 percent chance to win. If Clemson loses this game and Boston College goes on to win the division, the Tigers would have a 56 percent chance to reach the playoff. What’s at stake: OU’s shot at the playoff. If the Sooners lose a second game, the Big 12 officially joins the Pac-12 as an afterthought in the playoff race — unless one-loss West Virginia has something to say about it. Oklahoma and WVU are currently tied for the conference lead at 5-1, but Texas and Iowa State are both a game behind and still alive in the standings. Even if OU were to finish as a two-loss Big 12 champ, its playoff chances would sink to 15.7 percent, according to Playoff Predictor. If the Sooners lose this game and don’t make the conference championship? Zero percent. FPI says: Oklahoma has an 89 percent chance to beat the Cowboys. If the Sooners win out, there’s a 71 percent chance they reach the playoff for the third time in the past four seasons.